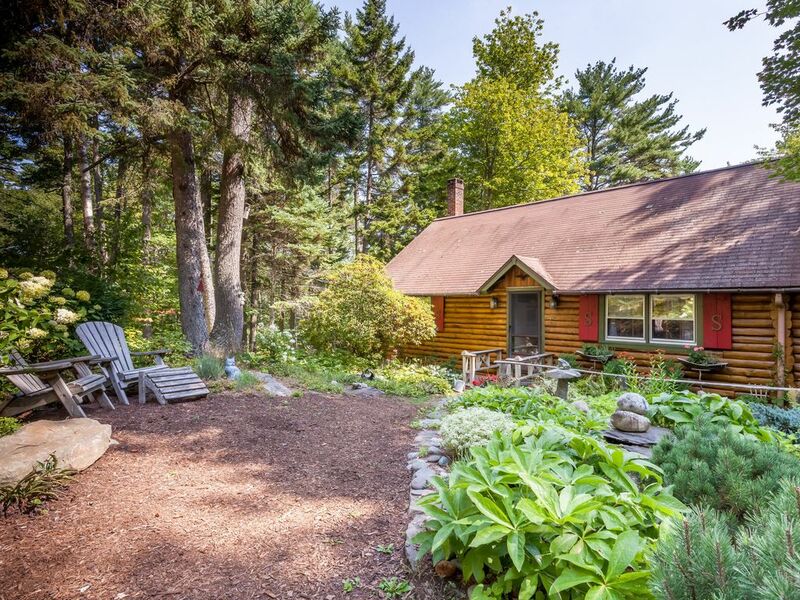 Located in the Sprucewold Community in a quiet, wooded setting just 5 minutes from Boothbay Harbor, this 2BR, 2BA vacation rental (sleeps 4) blends true log cabin charm and modern luxuries like high-end appliances in the renovated kitchen. Enjoy exclusive beach access to the Sprucewold Colony Beach! Nicely furnished with coastal Maine ambience, this peaceful cabin includes a screened dining porch with wraparound woodland views. At nearby Boothbay Harbor (just a 5-minute drive away from this secluded setting) try restaurants, boutiques and attractions such as whale watching, fishing, tours and more. Exposed beams and log walls welcome you to this coastal cabin, which is all on one floor. Use your unique digital access code to unlock the rental, and walk right into the newly renovated kitchen with stainless appliances and Corian countertops. An open concept living area benefits from huge windows that bring in the forest views beyond, with a glassed-in porch that’s also a dining room for 4. Overstuffed armchairs and a couch seat 4 in the living area, with an electric fireplace, flat-screen TV and bookshelf brimming with reading material for cozy evenings in. Coastal charm continues in the bedrooms. The master has a wrought iron queen bed wrapped in cream linens. The 2nd bedroom has 2 twin beds, a flat-screen TV, oil paintings and swing arm lamps. In total, this rental sleeps 4 guests. PLEASE NOTE: Maximum occupancy Nov 1 - Apr 1 is 2 guests. The 2nd floor (2 twin beds), is not available during the winter months. Both bathrooms are bright and cheerful, with walk-in showers and single vanities. Outside, landscaped gardens designed by a master gardener create a true retreat. Sit on the deck with wicker furniture and a gas grill, or head to the yard with even more seating: steal a quiet moment on the garden swing or doze on a lounge chair in the shade of spruce trees. Located within the Sprucewold Community, this rental has exclusive access to the Sprucewold Colony Beach. Originally developed as a rustic summer retreat in the 1920s, Sprucewold is a collection of cabins centered around the Sprucewold Lodge, just up the hill. The Lodge was listed on the National Register of Historic Places in 2014. Drive just 5 minutes to the Linekin Bay Resort, which has a pool and other amenities available for a daily fee. In nearby Boothbay Harbor, you’ll find casual and upscale eateries and shopping opportunities. There are plenty of on-water activities, too: from whale watching to sailing tours of the island to fishing expeditions. Drop by the Boothbay Lobster Wharf - less than a mile from the home - where you can buy cooked seafood or pick up live lobsters to take back home with you. Winter nights are aglow at Boothbay's Coastal Maine Botanical Gardens! Maine's largest light display just got even larger, with over 360,000 (and counting!) LED lights illuminating the central gardens and buildings and drawing festive crowds from all over. Visit for more info. Want even more lights? Don't miss the Boothbay Festival of Lights from Nov. 18 - Dec. 31. And we make it easy to stay with us! Drive straight to your rental and access the rental with a unique lock code that we give only to you. When you book, we will send you our mobile app with directions, lock code, and instructions. We’re available 24 hours a day with live help. My son and I had a great vacation at Sunny Brae. The upstairs and downstairs bedrooms had comfortable beds and it was nice to have an airconditioning unit on the ground floor. The place was clean, spacious, nicely decorated and well designed. The kitchen was stocked with cooking utensils and it was nicely lit. We especially enjoyed the deck and it was nice to have a screened-in porch to get away from the mosquitoes. The place was a bit expensive for the location, but we were glad we chose it. This cabin is perfect for a family of four or smaller. Very well updated, extremely comfortable beds, and very well appointed. It's charming and the location is great for visiting Boothbay Harbor. Just a short drive (about 2 min) to the walking bridge. We left my daughter's blanket at the cabin and Turnkey was extremely accommodating in helping us get it back quickly. Their staff is highly commendable. Had a great 3-night stay at Sunny Brae. Cottage was nicely decorated, clean and cozy. Beds were comfortable. Enjoyed morning coffee on the deck listening to the ospreys and lobster boats. Would definitely consider returning here on another visit to beautiful Boothbay Harbor! A rustic but modernized and well-equipped (mostly) cabin in a beautiful wooded location close to Boothbay Harbor. Our late-July stay was pleasant and relaxing, but issues did/do exist, mainly relating to the online property description vs. reality: Two window air conditioners advertised and pictured, none in place on our arrival; "master" bathroom in listing, but it is on the other end of the cabin from the master bedroom; living "on one floor" in listing, but bedroom #2 and its bath are actually on the second floor; outside swing was in place but hadn't been painted in years and actually was virtually buried in weeds. Having said all that, we still enjoyed the large modern eat-in kitchen, the beautiful deck, and the comfortable living room. While initially we couldn't reach anyone at the 24/7 number to complain about the lack of air conditioning and lost one night's sleep as a result, when we finally reached the company on Day Two, they were very helpful in installing one window unit right away and delivering a large fan on Day Three. At the end of our stay, we received a refund of a portion of our rental fee as compensation for the negative matters sited above. Therefore, the company ultimately was responsive to our concerns in a professional manner. If they will fix the few problems and/or correct the property description accordingly, this is a rental worth pursuing in an area of significant beauty. The cottage is great, with a cozy upstairs bedroom perfectly sized for our kids and a pleasant setting on the island. The beach isn't much to look at, but the paths and roads make for pleasant walks. The only thing missing was a sea view. We would come again. Our family of four enjoyed this cozy cabin nestled in the trees. The kids had the loft to themselves and had a great time. We loved morning walks and coffee on the deck. Highly recommended!